Rosso and Brunello di Montalcino: pure sangiovese or with cab? The typically Italian controversy currently raging over Brunello and Rosso di Montalcino is a battle between extremists. On one hand, conservatives want to keep the dogmatic principle of the single grape variety, which I hope to show is inconsistent with Tuscan tradition and penalizes those who want to make good wine in these areas. At the other end shameless opportunists are ready to perform a viticultural sacrifice by drowning Sangiovese with Bordeaux grape varieties that will leave no organoleptic trace of the Tuscan variety par excellence, to the point that it could safely be removed from the mixture altogether. In addition, everyone feigns that the problem is limited to Rosso di Montalcino, which was created as a catch-all repository for wines unworthy of the Brunello label, while everyone knows that the real issue is Brunello, and a vote on cheapening Rosso is a test before moving on to attack the prestigious cousin Brunello… Meanwhile, a recent scandal revealed that producers in Brunello were adding cabernet, syrah and merlot, and at least one prestigious producer got caught. I think it is self-evident that Bordeaux grape varieties will irreversibly pollute traditional Tuscan wine: it makes no sense to add them to Sangiovese, and I would be tempted to call such wines “Bordello di Montalcino” or “Cabernello”. But to insist on 100% varietal is no less absurd, and is certainly not coherent with Tuscan tradition, rather it is an accident in the recent history of Brunello. On another Dijon evening we dine at Restaurant Le Verdi, Place Emile Zola. 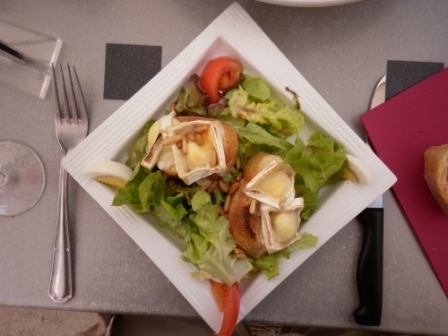 We share a Salade Chevre Chaud – squares of grilled chevre topped with pine nuts, set on crusty bread over a dressed green salad. Also, a perfectly al dente tortellini filled with ricotta and fresh asparagus sitting on a bed of creamy sauce dotted with petit pois. All washed down with a 500 ml pichet of Pays du Gard Rouge. 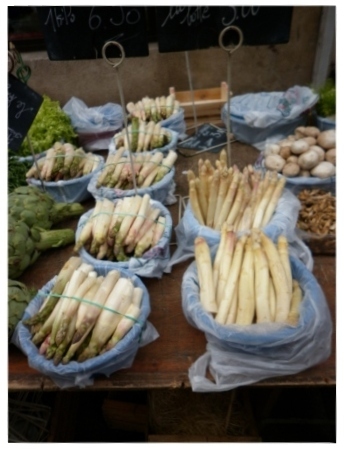 Food Observations Nowadays in France you can’t help but notice a significant amount of “biologique” (organic) food and wine in the shops. Organic wine apparently accounts for 10% of the French market, with consumption growing rapidly. 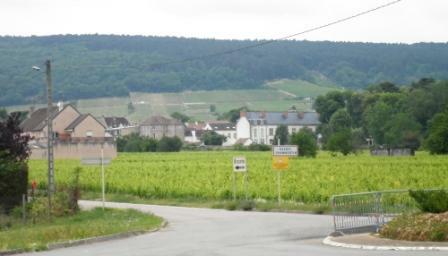 We visit the Cote de Nuits village of Gevrey Chambertin. Leaving Dijon, the bus sign for the Route des Grands Crus reads like labels on the top shelf of your fine wine store: Gevrey Chambertin, Vougeot, Vosne-Romanee, Nuits-St-Georges, etc. A chardonnay and pinot noir blend from the house of Martel. Pale gold in colour with the slightest pink tinge; flowers and subtle notes of brioche on the nose. A fuller style, with apricot and dried apple flavours in the mouth along with a hint of citrus. Opens with fruit sweetness and firms up towards the finish.